The new version of TCMS V2.2.024 supports online terminal activation as its default activation method. The Go Green DVD no longer comes with the TCMS V2 software’s activation key. Users can install the software and later activate it via the Internet. In the event the Internet connection is unavailable, please contact our support team at support@fingertec.com or your local reseller to retrieve the activation key. How to use the online activation function? product ID is printed on the license sticker. 2. 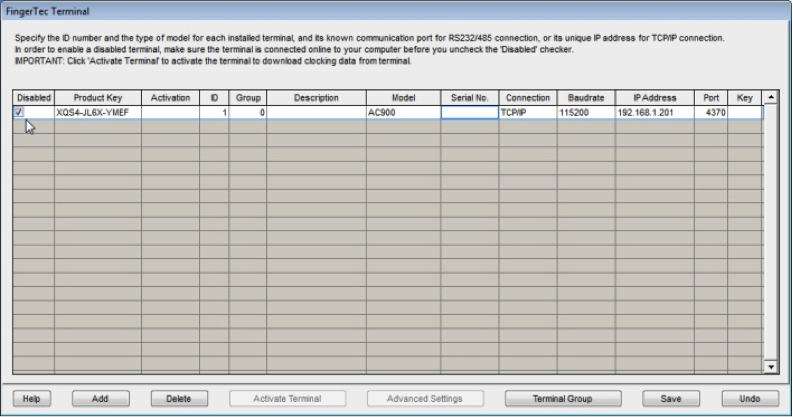 Configure the device ID, model, and IP address of your FingerTec terminal accordingly. Now uncheck the Disabled checkbox to allow TCMS to connect the terminal. 3. The TCMS V2 software will check the serial number of the terminal and communicate with the TCMS V2 server. The activation screen pops up when the connection is established successfully. Click Apply to activate the terminal with the product ID and terminal serial number. In case there is no Internet connection or the terminal’s online activation failed, please contact us at support@fingertec.com or your local reseller. 1. Supports the Face ID 4 and 4d. It is compulsory to use this version when transfering the users’ face templates for Face ID 4 and 4d. The new version contains new SDK commands to work perfectly with Face ID 4 and 4d. 2. Option to hide short minutes in Attendance Sheet. 3. Improved terminal and user synchronization with Webster database. b. Import employees from Sage UBS payroll master file (Malaysian market only). a. Resolved Weekly Time Card row spacing. b. Resolved print Job Cost Analysis report while "Show Zero Hour" is unchecked. c. Multiple summary rows for job cost analysis to Excel. d. Save Job cost analysis report to Excel with individual job cost total. e. Resolved printing of Electronic Time Card in two separate pages. f. Resolved Electronic Time Card report header when using Arabic language. g. Resolved Gross Wages report with leave hours and departmental sub-total issues. b. 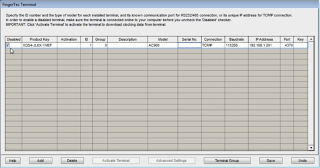 Resolved download terminal users for terminated checker option is not checked. a. Resolved overtime calculation for clocking range using hh.mm format. b. Resolved change hour format from hh.mm to hh.hh in job cost. Great in sequence! There is something wonderful about "FingerTec Technical Newsletter". I am fearful by the excellence of information on this website. I think, Computer problems can be complex and difficult to troubleshoot. Using proper troubleshooting techniques can speed up the process significantly. I am sure I will visit this place another time soon, to know about software troubleshooting. i've installed tcms v2.2.024 but printing employee time card still in 2 pages. Please help. Please update your TCMS V2 Software by connecting your PC to the internet, running the software and clicking the New Release option for an online update. i asking about sdk for tcms v2 ?? Please go to below link and sign up for the SDK that you request. hello i lost the product key for finger tec TA500 can you help to provide me? Please send an email to us at support@fingertec.com with information of what software you are using and the device serial number so that we can check the product key for your device accordingly.